What do a book deal, a whoopie pie and a bouquet of flowers have in common? You are here: Home / Uncategorized / What do a book deal, a whoopie pie and a bouquet of flowers have in common? Except today my book deal was announced so I had a whoopie pie! (I opt for sweets over alcohol every.single.time!) 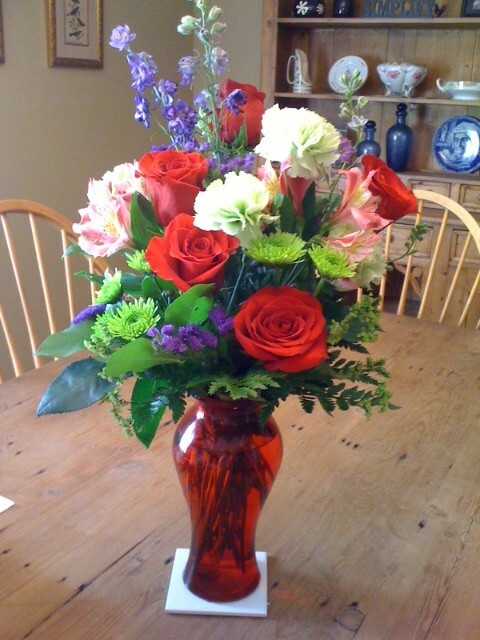 And, I received these beautiful flowers from my bff and her family. All in all, a delicious, fulfilling, humbling-beyond-belief kind of day — the first of many I’m thinking – although I’m going to save whoopie pie consumption for only the most auspicious occasions. Amy Sue Nathan’s THE GLASS WIVES, a portrait of the effects of divorce and death on the modern family unit where a woman is compelled to live with her ex-husband’s widow and her baby in order to save the home she loves, all while dealing with the scandal which erupts in their suburban paradise, to Brenda Copeland at St. Martin’s, by Jason Yarn at Paradigm. Of course a huge thanks goes to Jason who has believed in me and my novel from Day One when I met him via a Query Tracker contest. My editor, Brenda Copeland, has enough enthusiasm for the book and confidence in me to fill a stadium. Again, it’s all pretty exciting and very humbling. I have a feeling the best is yet to come and I hope you’ll stick around and find out right along with me. I plan on staying around for all the rest! I am so very happy for you! Amy, congratulations!!!!!!! I’m making hot chocolate right now, and I toast you and the success that will surely be yours. And thank you so much for all the wishes!!! Woo hoo! Break out the whoopie pies, chocolate and champagne! Such wonderful news! many more wonderful moments are yet to come! Major Congrats, Amy. I’m with you about celebrating. Forget the booze. Give me chocolate! Congratulations, Amy! I am a childhood friend of your mom and she has been keeping me abreast of all your achievements. This, by far, surpasses all of them. Bask in the joy of your success and know that many people share and rejoice with you. Great news for you, Amy Sue. Well deserved! Congratulations! Enjoy your celebration. The book sounds like MY kind of read. Mazel tov, congrats, best of wishes, break a leg and all that. So happy for you!! Over-the-moon excitement. Amy, your good news had me misty-eyed the entire day. So happy for you! I’m saving my pennies in order to attend your very first book signing (which I’m sure will be in your town, and not mine). Congratulations, Amy, and enjoy that Whoopie Pie and all the other good stuff! Sounds like a great book! I’m sure the PM announcement is just the first of many celebrations to come, so stock up on those whoopie pies. How exciting!! Congratulations and may your life be filled with whoopie pies!! Can’t wait to read it! I’m so very happy for you, Amy. It’s so well deserved! HUGE congratulatons — I hope we can see an interview with YOU soon on your wonderful blog — can’t wait to read all about your journey to publication and your best advice! Very, very happy for you! Maybe you could even have aNOTHER whoopie pie!? Absolutely. I’m not going anywhere! Many many congratulations to you! Can we have a ‘debut in 2013’ club?! How thrilling! Sounds like a fascinating story. Congratulations! I cannot believe I missed this. I’m living under a rock apparently. HUGE congrats to you! Can’t wait to see the book in print! A big congrats! I’m a huge fan of yours and can’t wait to buy many, many copies to cherish and share.